One S.P. French Mc and DJ in Edinburgh. Scroll down menu here » ALBUM LUNCH PARTY !! mc1sp.com | ALBUM LUNCH PARTY !! 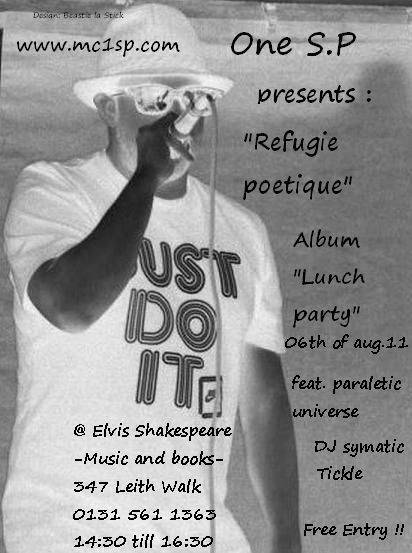 From 14:30 till 15:30 , One S.P will perform his album and some freshly released songs -like “sittin in the park” – along with his scottish no fax payday loans lenders counter actTickle (Black Lantern records) and DJ symatic and my good friend julien pearly (pundigrion films) who will sing our song “when it’s raining” and film the all event.